Wall Street cheers after the company announced favorable terms from a just-announced capital raise. Here's what investors need to know. 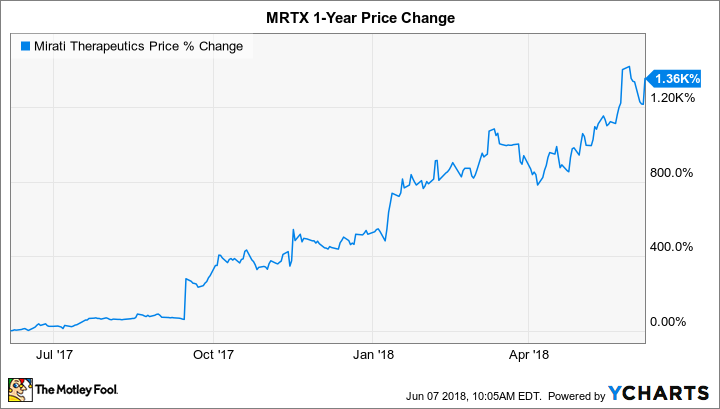 In response to the company sharing the pricing details of a recently announced secondary common stock offering, shares of Mirati Therapeutics (NASDAQ:MRTX), a red-hot clinical-stage biotech focused on cancer, jumped 10% as of 10:30 a.m. EDT on Thursday. Mirati announced on Wednesday afternoon that it intended to raise capital from a common stock offering. Mirati is selling 2.75 million shares of stock for $38.85 per share. Shares closed Wednesday's trading session at the exact same price. This means that the company didn't have to offer a discount at all in order to attract enough demand from investors. The company is also offering some investors pre-funded warrants that would allow them to purchase an additional 421,650 shares of stocks for $38.849 per share. The underwriters of the deal are also being granted a 30-day option to purchase an additional 412,500 shares of stock. The estimated proceeds from this deal are $123.2 million before deducting discounts, commisions, and fees. The deal is expected to close on June 11. Management stated that the proceeds from the deal will be used to fund future clinical development of its pipeline. Traders are likely cheering this news because the pricing terms suggest that there is huge demand for the company's stock right now. That's certainly a positive sign for the business. It's also worth pointing out that the deal seems well timed since Mirati's stock has been on an absolute tear over the past year. Shares of Mirati Therapeutics have been on fire ever since the company released data suggesting that adding its lead product candidate sitravatinib to Bristol-Myers Squibb's (NYSE:BMY) megablockbuster checkpoint inhibitor drug Opdivo could lead to improved health outcomes for patients with lung cancer. That's exciting news for shareholders since Bristol-Myers Squibb recently signed a multibillion-dollar deal with Nektar Therapeutics to get its hands on a drug that also promises to enhance Opdivo's effectiveness. It is reasonable to assume that a similar deal could be in the cards for Mirati if the company continues to prove that sitravatinib is the real deal. On the flip side, Mirati's most advanced clinical programs are still just in phase 2, so this company is an extremely speculative investment. For that reason, my plan is to keep this stock on my watchlist for now. However, given its long-term potential, I plan to track its progress with great interest.